There are many things that causes Chronic Fatigue syndrome but before we look at the causes, let’s look at what Chronic Fatigue means? According to the Geddes & Grosset Dictionary Chronic means: Long Lasting, Fatigue means: A tiredness from mental and/ or physical effort, Syndrome means: a characteristic pattern of signs and symptoms of a disease. In short we are looking at a period where we are always tired. The question that needs to be answered is: Why? There can be many reasons – viruses, bacterias, chemicals, Fungi, parasites, tick bites, even Lyme disease. The way our citizens are travelling these days, we have to keep our minds open to diseases that are relatively new to Australia, making the task of finding the underlying cause even harder. 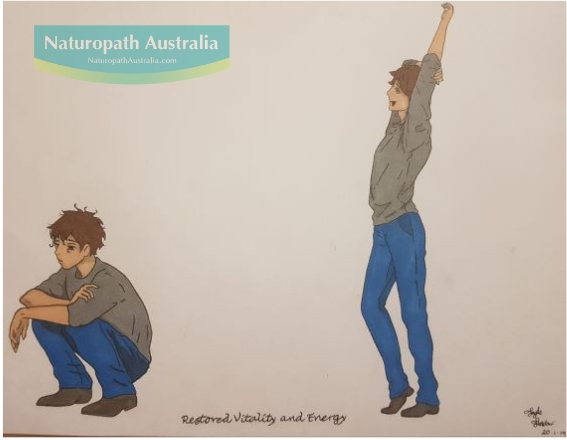 I have discussed the long term effects of Glandular Fever and you can read about this in other pages on the Naturopath Australia website but in short, Glandular fever can be a common cause of chronic fatigue Syndrome. In Queensland, we have many tropical diseases that can have the long lasting effect of Chronic fatigue Syndrome. We had a patient arrive on our doorstep that had laid on her bed for 10 years unable to go out of the house. Friends of hers from North Queensland brought her down to the Gold Coast and asked if I would treat her. It turned out that she had had 5 tropical diseases that had not being diagnosed: Barmah Forest, Ross River Fever, Dengue Fever, Epstein Barr virus and Cytomegelo virus. It was not an instant miracle, it took about six months for her recovery to be to the stage where she could go bush walking again and do all the things that she used to love so much. Her next goal she tells me is to climb the Kimberleys . If you are a bushwalker, you have to look for the after effects of tick bites, mosquitoes, parasites and even take into account the possibility of toxic drinking water. The chemicals that are sprayed to kill weeds can affect a lot of people if they breathe the fumes into their lungs. The kidneys may have a problem filtering the chemicals through the system, thereby causing a long term illness, which may exhaust the patient as well as leaving behind symptoms of vertigo and nausea. Fungi is another possibility that should be taken into consideration, especially people that live in homes that have mould in them. If the mould is in the bedroom the patient may be breathing in mould spores every night that they sleep in that room, it builds up in the lungs over a period of time and weakens the immune system, creating a chronic fatigue situation. I had one patient that came to me with the cantilevers bored into her forehead. She used to go to the hospital every six weeks to have her sinuses drained. She told me that it was agony to have the procedure done. She couldn’t take deep breaths and felt that she never had enough oxygen in her body. She could not get off her bed for very long as she became so exhausted. Deep relaxing sleep evaded her,she even woke of a morning with chronic tiredness. I put her on an anti-fungal diet, and gave her herbs to inhale to break down the fungi in the Sinus cavities. She was very sensitive to everything, so I had to be very cautious with any treatment that I offered. We were able to slow down the post nasal drip, which was the first big breakthrough that we had. From there on in, her symptoms started to improve at a great rate and now she enjoys good health, but still very aware of mould and the dangers it can mean to our health. For Chronic Fatigue to be treated, you need to recognise the cause first. We determine this by doing a hair sample and suggesting natural medicines that will help restore your vitality and energy. To order your Hair Analysis click here.